As a lover of cooking and of course eating, there's nothing I look forward to more than going abroad and trying new foods. I really love looking at different and exciting menus. That said I know there are a lot of people that wont even try anything new. If you do feel like that, I'd love to be able to encourage you to just look at the delicious foods that countries such as Spain has to offer. 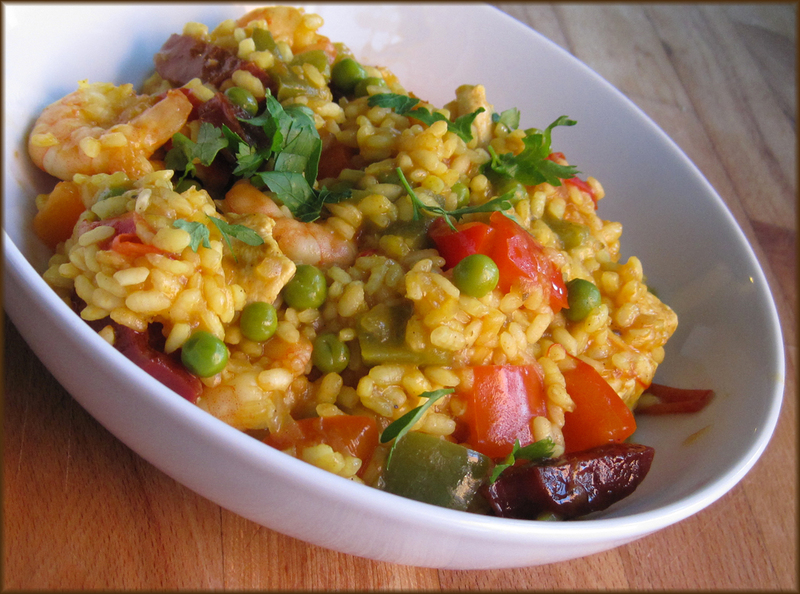 Such wonderful colours, different textures and flavours a dish such as Paella has to offer. Chicken, peppers, slightly spicy chorizo, peas and perfectly cooked flavorsome rice to name but a few. But as I say, I don't need convincing. I just love the wonderful ingredients and flavours of the Mediterranean and their easy and relaxed style of cooking. 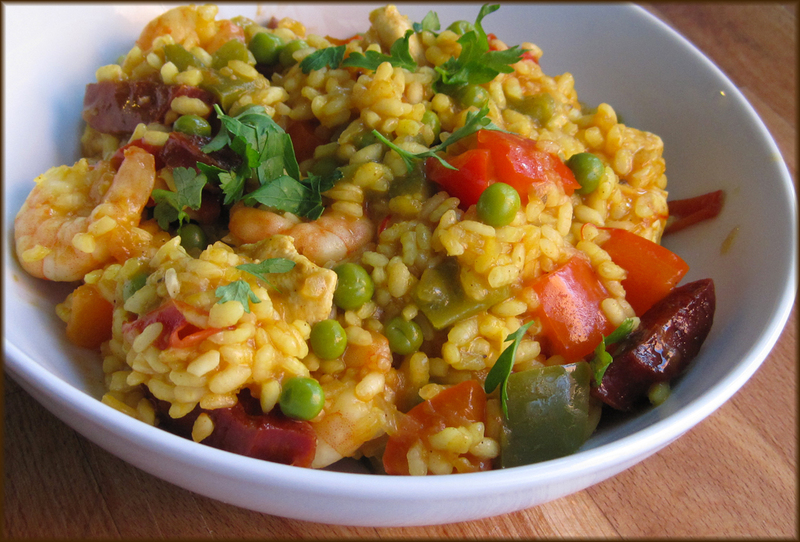 Although Paella does seem to have a never ending list of ingredients, it's so worth giving it a go. Everything ends up in one big pan I find it quite relaxing watching it cook and adding another ingredient now and then giving it the occasional stir. As with any recipe, if there's something that you really don't like, I say just leave it out! Cooking should be a matter of personal taste and not fussing too much about following a recipe to the letter, cooking is an experiment. Of course when it comes to baking you have to follow a recipe of your cake or bread wont happen which is why you wont find too much of that on this blog. I've hardly ever followed a recipe properly in my life, just go with what you like to eat. Paella has so many fantastic flavours but you can miss out the clams and mussels if you really don't fancy them. My husband just doesn't like them and so I didn't add them - simple. Here's a recipe for a traditional Paella which is really easy to make so you might want to try out at home. Who knows, when you next book a city break to Barcelona, and the waiter asks what you'd like to order, you'll say 'I'll have the Paella please'! Heat half the olive oil in a paella dish or very large heavy-based saucepan. Add the chorizo and pancetta and fry until crisp. Add the garlic, onion and pepper and heat until softened. Add the thyme, chilli flakes and calasparra rice, and stir until all the grains of rice are nicely coated and glossy. Now add the paprika and dry white wine and when it is bubbling, pour in the hot chicken stock, add the chicken thighs and cook for 5-10 minutes. Now place the clams into the dish with the join facing down so that the edges open outwards. Sprinkle in the peas and chopped tomatoes and continue to cook gently for another 10 minutes. Meanwhile, heat the remaining oil with the garlic cloves in a separate pan and add the prawns. Fry quickly for a minute or two then add them to the paella. Now do the same with the squid and add them to the paella too. Scatter the chopped parsley over the paella and serve immediately. Go on, give it a go and I think you'll be pleasantly surprised. This is a sponsored post, all thoughts are my own. I love a tasty paella Jan.